It has been a while since I read this book, but some how couldn't put my thoughts together to write a review. 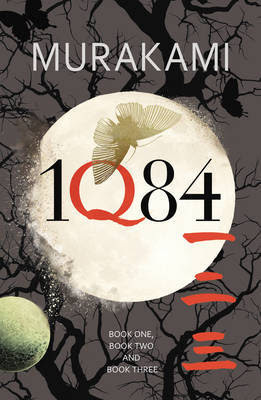 1Q84 by Haruki Murakami is a huge book, it is the first book by the author that I have read. It can be categorized as a thriller and a fantasy love story. To be able to appreciate this novel fully, the reader has to believe in what the author is trying to convey. That becomes a challenge in the later part of the novel. The story is set in year 1984 and spans over the year. Book One starts with the female protagonist of the novel, Aomame (a name which literally means green peas in Japanese) in a taxi on a Tokyo highway. There is a huge traffic congestion and vehicles are moving slowly. To be able to reach for her scheduled appointment Aomame, on the advice of the taxi driver takes a short cut. That seems to work fine but after a while, she discovers seriously puzzling discrepancies in the world around her. She realizes that on taking the short cut route, she has entered a parallel existence which she calls 1Q84,Q for question mark. This world has two moons in the sky(that is evident from the cover). There are a lot of questions in this world that Aomame has to find answers to and time is not on here side. Meanwhile, an aspiring writer named Tengo Kawana takes on a suspect ghostwriting project. He becomes so wrapped up with the work and its unusual author, Fuka Eri that, soon, his previously placid life begins to come unraveled. The novel Air Chrysalis makes it to the top of the chart, only to complicate things for every one involved in the projects. From one thing to another, the author conjures up a complicated plot that successfully keeps the readers hooked. The pace created in Book One carries well into the Book Two. Murakami is an author with huge creativity and vivid and fantastic imagination. One would not be able to predict what turn the story is going to take. At the close of Book Two, both Aomame and Tengo finds themselves in precarious situation, threatened and confused. There are many loose ends in Book Two which I was hoping would be addressed in Book Three and hence I promptly borrowed the Book Three from the library. In Book Three, Aomame and Tengo are pursued by people and forces that seem to be from some other world. They try to decipher the strange world around them and soon realize their destinies converging. What they cannot surmise is if they would be able to find each other before they are themselves found. What actually happens is the thing to find in the book. Book Three did not live up to my expectation. Fantasy is fine but loose ends are what leaves me unsatisfied. The author didn't even try to convince as to why things were happening the way they were. It actually left me squirming in uneasiness and for a while I couldn't decide if it was a good thing or bad. Finally, I felt that I must be able to picture things in the novel to understand them fully, like I have no idea who these little people, what they want, from where they come. May be the author wanted to keep it to the imagination of the readers, but it didn't work for me. The whole plot seemed to concentrated on making Aomame and Tengo meet, but why take them to a different world to make that possible. I enjoyed the first two books, they kept me dangling by a thread. But, Book Three disappointed me. Certainly, I don't understand the hype around the book. I would give it a balanced 3/5 overall rating.